Discovered: Why There are so Few Leaders | The Secretan Center, Inc.
We have been discussing the difference between “managers” and “leaders” forever. But as I have worked with leaders over the years I have discovered within this distinction an important secret that may explain why we have so few real leaders. Most leaders begin their careers as managers, and earn their promotions by constantly delivering better managerial results. As you can see from the chart above, the left columns shows how we train, reward, and promote managers for managing increasingly complex responsibilities, and we promote them into leadership roles when they are at the height of their analytical and operational skills attainment. Being a great leader requires an entirely different skill-set for which they have not been trained or equipped, and these are shown in the right-hand column in the chart above. I hear from employees almost daily, how their leader has great expertise, but no “people skills”. Therein lies one of the key reasons why 80% of the population would quit their jobs if they had a free choice and 65% of employees would take a new boss over a pay raise. Here I describe the “Jekyll and Hyde” aspect of so-called leadership qualities (which sound much more like managerial qualities) and the qualities of inspiring people. How to get past this dismal result and transform our leaders into people who inspire others to high performance is the subject of my latest book, The Bellwether Effect. Take this 1 minute quiz to learn whether your organization is “managed” or inspired. As a client said to me recently, and so eloquently, “The skills I learned in my MBA program 20 years ago are not going to help me to transform my organization into an inspiring power-house”. Let’s be clear: moving from management to leadership is not “a promotion” – it is “a career change”! Thanks for the insight most of the managers concentrate more about paper work and deadline, what they lack most is people management. They value work more than the man, though work is important man is more important than work. So true. But we teach “how to get work done” not “how to inspire people” to get work done. 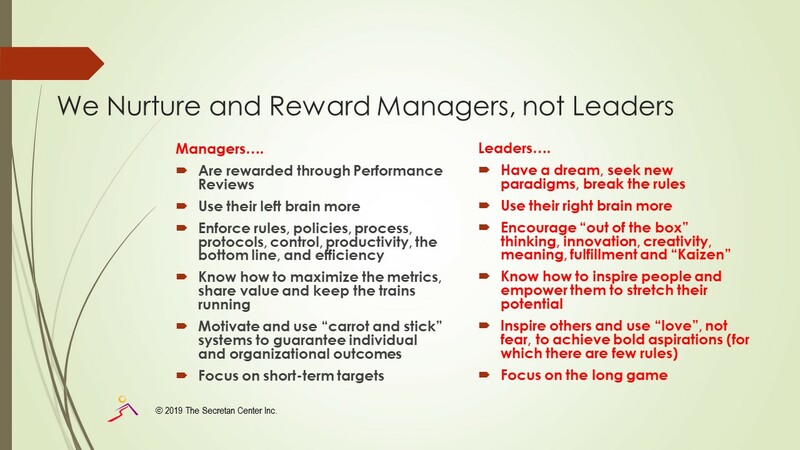 I’ve seen many distinctions between managers/boss vs. leaders. Your chart is very simple and brings to light in a positive manner the great divide between the two. Some managers can make the transition, but it is almost like a career change! I love “leadager” great idea! However, duality will not give us the skills necessary to be a great leader if the new leader has only received managerial skills development and training. Thinking “duality” will not magically bestow new skills on me! Additionally, we often provide “leadership development” training for managers, especially those on a “fast track”, but it’s often just more managerial training – old wine in new bottles! My definition is management is taking control, and leadership is letting go. I also believe that you can teach someone to be a manager and make them a better manager, but leaders are bred in the bone. You are borne with leadership traits that demonstrate themselves very early in life and yes, you can also become a better leader. But you cannot train someone to be a leader — either you are one or not. I love your definition of management and leadership Patricia. I would hope that if I aspired to a leadership role, I would be open to learning what it takes to be a leader who inspires others to high performance – isn’t that a realistic assessment? Lance, as always, thanks for a very thought-provoking ‘piece’. Whenever the conversation of ‘Leaders vs. Managers’ comes up I always reference the words of Warren Bennis…..Managers do things right…..Leaders do the right thing’—-as Bennis taught us…..Managers keep their eyes on the bottom-line but Leaders keep their eyes on the horizon———Leaders do less rowing and more steering——-less ‘doing’ and more ‘influencing’——-good leaders spend less time at their desk and more time ‘on the front lines’ —-listening, connecting, motivating and inspiring——-a few minutes looking into people’s eyes is worth more than pages and pages of e-mails. Ron, I love your comments and definitions. I used to like Warren Bennis’s definition more than I do now, because I feel “doing things right” isn’t just for leaders – it describes all of us. But the distinctions of Bottom Line/Horizon and Rowing/Steering, are perfect! Thanks again for these great insights.